David Brock, chairman of the 501(c)(3) tax-exempt group Media Matters for America and self-described “Democratic political activist”, headlined a Democratic Party of Oregon fundraiser in Portland on Friday. 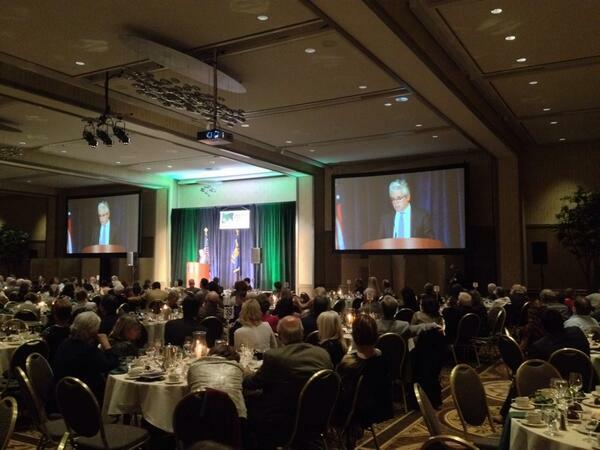 “Join Senator Ron Wyden, Senator Jeff Merkley, former Governor Barbara Roberts, and our special Keynote Speaker—David Brock, founder of Media Matters—for the 2014 Wayne Morse Gala at the Portland Hilton. “David and Media Matters have been on the front lines since 2004, pushing back hard against the lies and distortions of the right-wing media machine and standing up for the truth every day. The Statesman Journal reported the fundraiser was sold out with over 500 people paying $135 per person. There are no reports on Brock’s speech except for a few photos and comments posted to Twitter. Brock is scheduled to appear on CNN’s Reliable Sources on Sunday at 11 a.m. EDT. He is set to rebut speculation by former CBS News reporter Sharyl Attkisson that Media Matters was paid by donors to attack her once she started reporting unfavorably on the Obama administration. Will host Brian Stelter ask Brock about Attkisson’s other claim, that Media Matters helped produce news reports with her at CBS News? Will Stelter ask Brock about Brock and Media Matters violating the group’s 501(c)(3) status by engaging in electioneering on behalf of the Democratic Party? Probably not, but we’ll tune in to find out.